I wanted to introduce you guys to my first paid pattern I recently released. Its my Drifter Boho Vest. A lot of time, frustration, and frogging went into making this awesome new pattern, but I couldn’t be happier with the end result. It is truly my favorite design I have made so far (hence why I have already made myself 2 vests!). Some of you may be wondering if I still plan to offer free patterns or only paid patterns from now on, and the answer is yes, I will still be posting lots of free patterns for you guys! I do plan to make some of my more complex patterns paid only, and I appreciate your understanding and support. Every visit to my blog or purchase of a PDF patterns allows me to keep my blog up and running and sharing great patterns and tips with you all. I watched a Instagram Live from Toni of TLYarnCrafts which lead me to make the decision to make this small change. You can see her post 6 Signs It Might Be Time To Raise Your Prices if you want to check out what inspired this change for me and maybe it will inspire you as well! I wanted to give you guys some basic information about this pattern to help you decide if its something you think you wanted to purchase or not. If you decide you want to purchase the pattern, you can get it here from my Etsy Shop. I will put as much information as I can on here, but if I forget something that you want to know about please leave a comment below and I will get back to you! The original size fits sizes S-L. The total width of the vest when opened and laid flat is approximately 42 inches. The back panel is 24″ in width. Sizing can also depend on your tension. If you tend to crochet tight I suggest moving up to a 12mm hook. Length can be adjusted by adding or deducting rows. 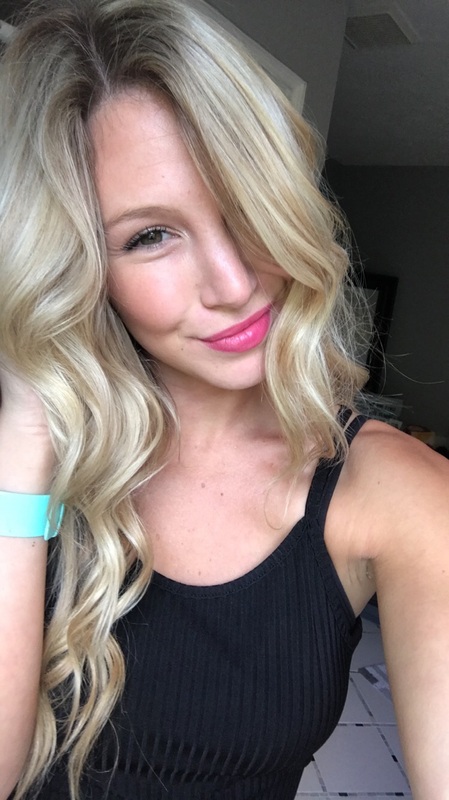 I am a size 10-12 and am 5’9″. I tend to wear a size large in most garments if you want to use the photos to assist you gauging if this pattern is right for you! The oversized/plus version fits between an XL-2X with directions on how to increase the pattern width even more to accommodate more sizes. This also works great for someone who just wants a more “oversized” fit with their vest. The total width of the vest when opened and laid flat is approximately 56 inches. The back panel is 30″ in width. Sizing can also depend on your tension. Yarn: I used cotton yarn but really any worsted weight yarn would work. Approximately 620 yards will be needed. This will vary on your tension and well as the length of your tassels. Cotton will work best if you plan to use this as a swim suit coverup. Level: This is an intermediate level pattern. 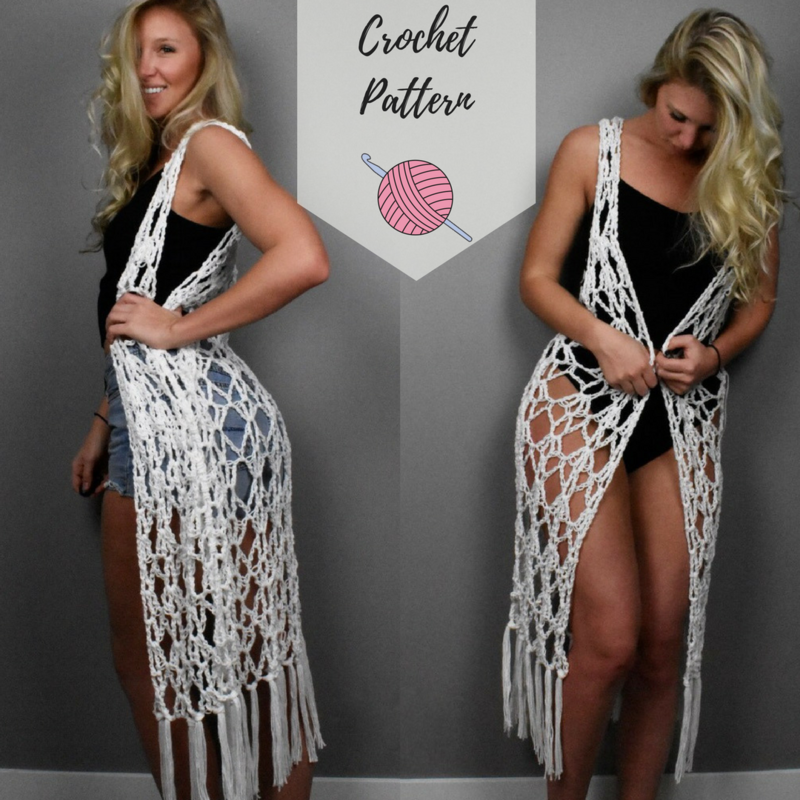 What’s in the PDF: The PDF includes a written pattern as well as crochet charts to assist you in following the pattern. For this specific pattern I thought charts would be very beneficial. The charts will help clarify which stitches to crochet into what the over all look of the stitch pattern should be. Hi, I tried this pattern and it turned out beautiful except it’s like half the size it’s supposed to be… I counted all my rows and I didn’t miss any. Do have any idea where I may have gone wrong? (I know it’s me not the pattern) I used an acrylic yarn. The only things I can think of would be if you used a smaller hook Size that I used or your tension was too tight? I know with acrylic yarn that it is easier to crochet with a tighter tension than cotton is since cotton has little to no stretch in it. I have made this pattern in a worsted weight acrylic and it was a tad smaller but only by 2 inches. Do you mind letting me know what your measurements were of your final project? So with our tugging on it or anything it measures about 24inches long and laying flat from seam to seam is about 10-11 inches. But there seems to be a lot of stretch in this yarn and I crochet tight. I want to try it again with cotton and possibly a bigger hook to compensate for my tight stitching. Kayla what size hook did you use? Have you tried blocking the project as well? Would you mind sending me a photo of your finished project to my email so I can see what yours looks like? Taylorlynncrafts@gmail.com Thank you! Hi Tay! I’d like to give this a try but have only made granny squares before. I can knit but I haven’t done much crocheting. Is this beyond my abilities? The only stitches used in this pattern are (US terms) treble stitch, double crochet, single crochet, and chains. These stitches are used in a varying pattern. I do have charts to further clarify the pattern repetitions, but a beginner may struggle. You can always practice some more before purchasing the pattern, or you could purchase it now and if it seems too difficult now, it will be something to work up to! I hope that helps you decide! Hello. I did purchase the pdf but I didn’t receive the plus size pattern which is the one I really wanted. Please help how do I get that one?